Drug Companies Pay Up in Illegal Marketing Cases, But Are Penalties Enough? If you make truck deliveries in the overcrowded downtown streets of a big city, parking tickets might simply be a cost of doing business. For top drug companies, critics say, there’s an equivalent expense — the billions of dollars paid out to settle criminal and civil charges of illegal marketing practices, Medicaid overcharges and kickbacks. Big Pharma has written more than $30 billion in checks in the last 10 years to resolve the government allegations, according to statistics compiled by the consumer watchdog group Public Citizen. 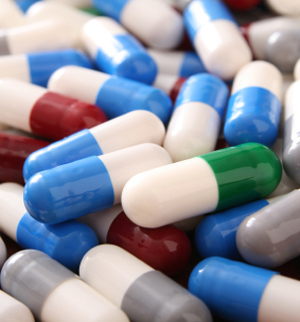 Nine drug manufacturers each forked over at least $900 million from 2006 through 2015. Yet those sums, Public Citizen says, are essentially petty cash for the drug giants. 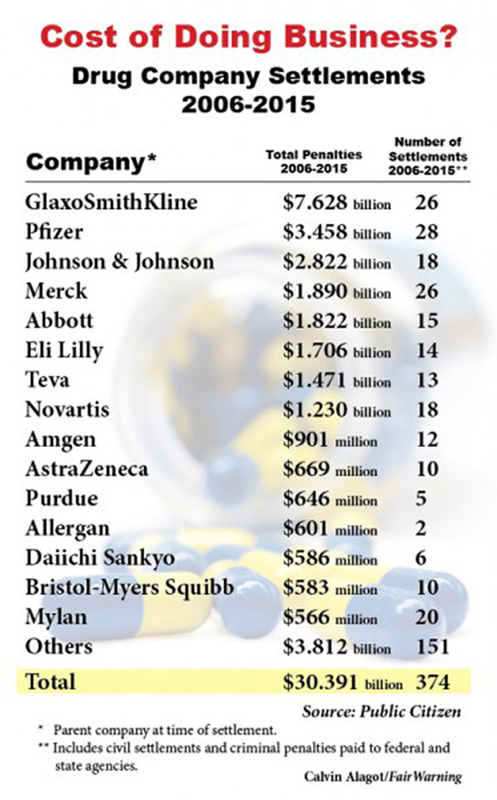 The advocacy group, which seeks stiffer sanctions against violators, says the settlements amount to less than 5 percent of the net profits raked in by the 11 largest global pharmaceuticals firms over a similar period. “The financial rewards companies reap from engaging in these behaviors far outstrip any penalties they pay,” said Harvard Medical School professor Eric G. Campbell, who researches doctors’ conflicts of interest. GlaxoSmithKline headed the payout list for the decade, ponying up $7.628 billion, more than double that of runner-up Pfizer, at $3.458 billion, according to Public Citizen. In the largest health fraud settlement in history, Glaxo pleaded guilty and paid $3 billion in 2012 to resolve criminal and civil charges of promoting Paxil and Wellbutrin for uses not approved by the U.S. Food and Drug Administration. The government said Paxil, an anti-depressant, was unlawfully promoted to treat patients under age 18, while Wellbutrin, approved for major depressive disorder, was promoted for unapproved uses such as weight reduction and treatment of sexual dysfunction. Thirty-one firms in the last quarter-century were repeaters, with two or more settlements. Glaxo and Pfizer again led the list, with each entering into 31 settlements with federal or state agencies since 1991, the research showed. Neither firm responded to requests for comment. What’s known as off-label marketing – promoting drugs for uses other than those approved by the FDA – dominates the list of settlements. While doctors can legally prescribe pills for off-label use, drug companies can’t push medicines for such purposes. Some of the biggest prosecutions, however, involved drug companies that engaged in extravagant efforts to market their wares to physicians, hospitals and nursing homes for off-label uses. In some cases, anti-psychotics approved by the FDA to treat patients with schizophrenia were instead promoted to control the behavior of elderly dementia patients. And some doctors prescribed the drugs after being plied with kickbacks, consulting deals and other favors from the drug industry. “We think not enough has been done to prosecute doctors and hold them accountable for egregious activities,” said Dr. Sammy Almashat, lead author of a recent Public Citizen report on drug industry settlements. In one of the biggest health fraud settlements, Johnson & Johnson agreed in 2013 to pay $2.2 billion to resolve a case involving allegations that it conducted off-label marketing of the anti-psychotic Risperdal to doctors treating elderly dementia patients. The Department of Justice, in its criminal complaint, said the drug “increased risk of death among elderly dementia patients.” The department said Johnson & Johnson also played down, or fudged, findings that the drug raised the risk of strokes and diabetes. Since 1991, unlawful promotion cases have accounted for about $11 billion of a total of more than $35 billion in civil and criminal settlements — far more than the payouts for overcharges to government health programs, kickbacks or monopoly practices. After reaching a peak of $6.35-billion in 2012, settlements have fallen. Public Citizen’s report cites, as possible reasons, a shift in the focus of prosecutions and free speech court rulings involving drug marketing. In one of those cases, a drug manufacturer won a preliminary injunction after suing the FDA, claiming that restrictions on off-label promotion clashed with its First Amendment rights. In addition, given that patents have expired on some of the anti-psychotic medicines that were the subject of major off-label marketing lawsuits, marketing of those drugs was bound to dwindle. “The companies have no motivation to sell them [any more], even for their indicated uses,” said Dr. Lon S. Schneider, a psychiatry professor at the University of Southern California medical school. Harvard professor Campbell says another factor may be the recent spotlight on doctors and researchers who in the past accepted free vacations, martini-soaked dinners and other swag from drug companies. In 2009, ProPublica, a nonprofit investigative journalism organization, launched a “Dollars for Docs” database. The data largely reflected disclosures that drug companies were required to make under settlements stemming from improper marketing allegations. A federal Sunshine Act followed, requiring more companies to publicly disclose payments to doctors. The information is available on this searchable database. “There has definitely been an increase in interest in this by the media,” Campbell said. He added that he believes the news coverage spurred some doctors and institutions to reject, or discourage, payments from drug companies. Almashat said that while “sensational stories of doctors being wined and dined” by drug companies have declined, prosecutors need to remain vigilant about “much more subtle and sophisticated” means for influencing physicians. He pointed to hefty fees paid by the companies to doctors for consulting work or speaking engagements. Suffolk University law professor Marc A. Rodwin, who has written on drug company sanctions, says one solution might be charging drug company officials personally, so that they could face fines or even criminal misdemeanor counts. He added, however, “there seems to be a reluctance of prosecutors to act” against corporate officers.